"Battle of the Chicago Convention, August 29, 1968"
August 29, 1968 Chicago Mayor Richard Daley ordered his police to attack peaceful protesters outside the Democratic National Convention as protesters chanted "The whole world is watching." The conflict occured as the Convention seated all of the delegates of Lyndon Johnson's War Salesman, VP Hubert Humphrey over delegates pledged to Peace Candidate Sen. Eugene McCarthy who had knocked LBJ out of the race in New Hampshire. Sen Robert F. Kennedy subsequently entered the race, also on a Peace platform and ran neck and neck with McCarthy all the way to California. Upon winning the California Primary and the delegates to win the Democratic Nomination, Kennedy was assassinated and every single delegate pledged to him was persuaded to vote for Humphrey who jumped into the race with his war platform. I did a number of paintings of this subject, but this little oil sketch was always my favorite. 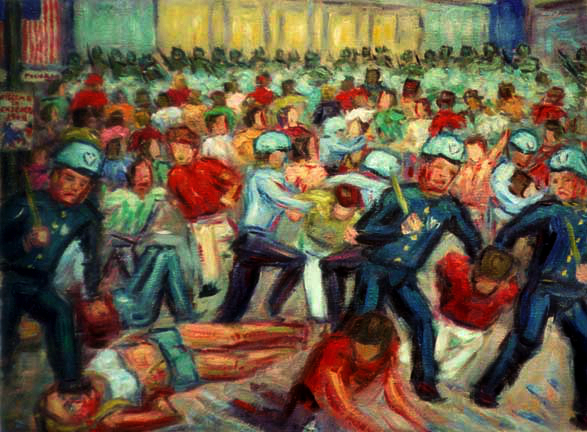 I especially like the fluidity of the foreground figures who are being beaten and the ferocity of the cops doing the beating. PaulB's Pointillistic/Impressionist original oil paintings of History of the 60s and various prints and poster formats of a wide variety of subject matter by the Pointillistic/Impressionist oil painter from landscape/waterscape paintings, dance, sports, portrait, to classical figures, flowers, rock and roll, Brazil, and History of the 60s paintings and prints are available for purchase for as little as $24.95 for an 8" x 10" matted print on photo pape. Pointillistic/Impressionist Giclee prints of History of the 60s on real canvas or heavy watercolor paper are available. One of a kind History of the 60s embellished prints, which are Giclee prints retouched in genuine oil paint by PaulB. Unless noted PaulB's original Pointillistic/Impressionist oil paintiings are oil on canvas. Paul Berenson's pointillistic/Impressionist oil paintings are in privale collections around the world, including the downtown Los Angeles Athletic Club and have appeared in numerous publications, including the New York Philharmonic Playbill. PaulB.com also builds websites and PaulB is a member of the LA Web Professionals Group.